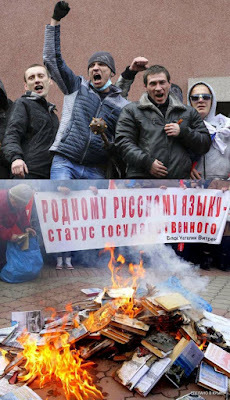 DONETSK, Ukraine (Reuters) - Pro-Russian demonstrators in eastern Ukraine smashed their way into public buildings and burned Ukrainian-language books on Sunday in further protests following two deadly clashes in the region last week. Protests, some several thousand strong, spread to Russian-speaking southern districts as Ukraine's Crimean peninsula, under the control of the Russian military for two weeks, voted in a referendum on joining Russia. Violence in eastern Ukraine, where Russian-speaking ethnic Ukrainians are in the majority, has prompted warnings from Moscow that it is prepared to "defend" the rights of residents who disagree with the new pro-Western authorities in Kiev. Clashes have broken out when rival rallies take place in proximity - pro-Russian groups against others backing the call by Ukraine's leaders for closer ties with the European Union. The Kiev authorities, who have denounced the pro-Russian protests in the east as the work of "Kremlin agents", came to power after three months of often violent protests culminated in the removal of Moscow-backed president Viktor Yanukovich. 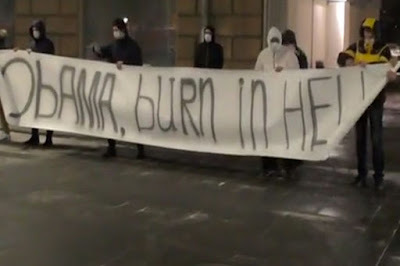 In Kharkiv, Reuters Television footage showed pro-Russian activists breaking into the headquarters of a Ukrainian cultural centre, removing Ukrainian-language books and setting them alight in small bonfires in the street. Protesters moved through the city centre trailing banners dozens of meters (yards) in length bearing the Russian tricolor. On Friday, two pro-Russian protesters were killed by buckshot after a confrontation outside the same cultural centre with activists from Ukraine's extreme-right Right Sector group. In Donetsk, the heart of the Donbass coalfield, where a pro-Ukrainian activist died in clashes on Thursday, 5,000 protesters roamed from a central square to several public buildings, smashing doors and windows as they went. The massed for a time outside the local prosecutor's office before lines of riot police let them through and they pushed their way inside with poles and sticks. 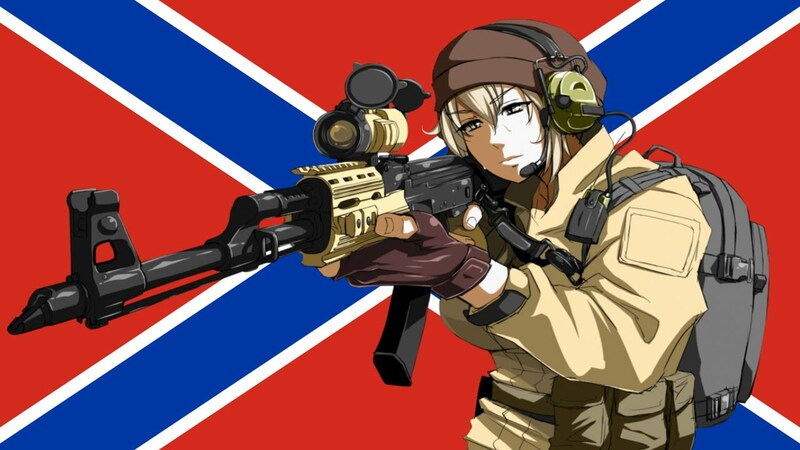 A small group clambered onto the roof, snatched away the blue and yellow Ukrainian flag and waved red-white-and-blue Russian standards. Activists then moved on to the offices of the SBU security service, pushing their way inside for the second day running, before going to the headquarters of the Industrial Union of Donbass, owned by magnate and local Kiev-appointed governor Sergei Taruta. 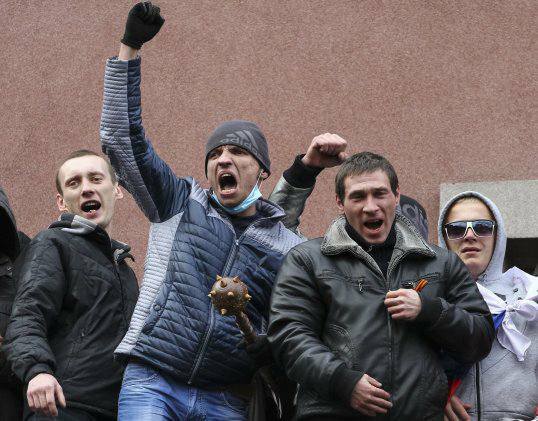 Activists, many of them bearing the orange and black colors of the "St George ribbons" worn by Russian nationalists, were demanding the release of an activist who had briefly proclaimed himself "people's governor" of the region this month. Several thousand pro-Russian demonstrators marched through the streets of the Black Sea port of Odessa. 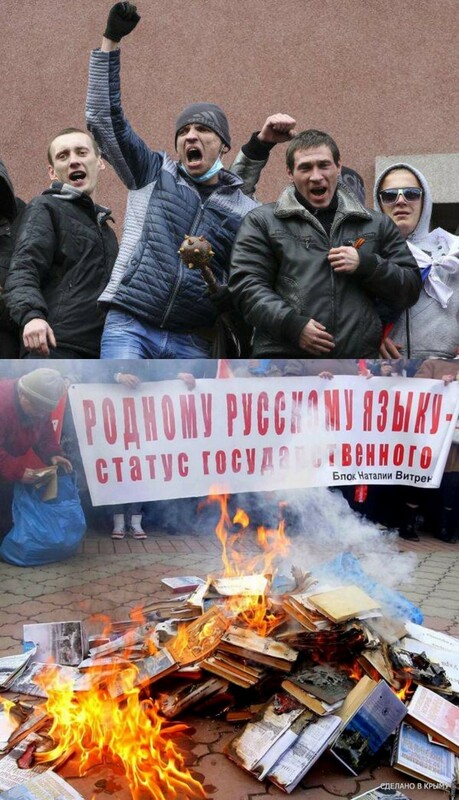 Two cities held impromptu "referendums", banned by local courts, echoing the plebiscite being conducted in Crimea. In Luhansk, a coal-mining centre in northeastern Ukraine, organizers set up ballot boxes in a square asking voters five questions ranging from Kiev's new leaders to the creation of a federal state. A similar referendum was staged in the southern city of Mikolayiv.